Are You a 'Blue Republican'? These days, Rand Paul can often be heard saying that the Republican party needs to become competitive in "the West and New England," and that the more libertarian brand of Republican politics that he represents will help make that possible. In 2008, Democrats and Independents voted for Obama, believing that, in voting against Bush's Republicans, they were voting against crony corporatism (remember Halliburton, corporate bailouts? ), wars of choice (Iraq) and the take down of our civil rights (Patriot Act). Two years ago, a huge number of them realized that not only did their vote fail to stop any of these, but Obama was a kind of Bush-plus, extending and even deepening illiberal policy in all of these areas. As recent revelations about America's massive surveillance state have revealed, they were right. Many of these disillusioned Obama voters came to understand that the real problem was bigger than one party or the other, one president or another, but that, "the presuppositions of the system," as Noam Chomsky calls them, ensure that the state, under control of either party, consistently and increasingly acts at the expense of our basic individual liberties, Bill of Rights be damned. Thousands of these voters chose to stay true to their liberal principles by becoming (often for the first time in their lives) signed-up Republicans to support Ron Paul in his run for the presidency. In an article that I wrote at the time, I called them "Blue Republicans." 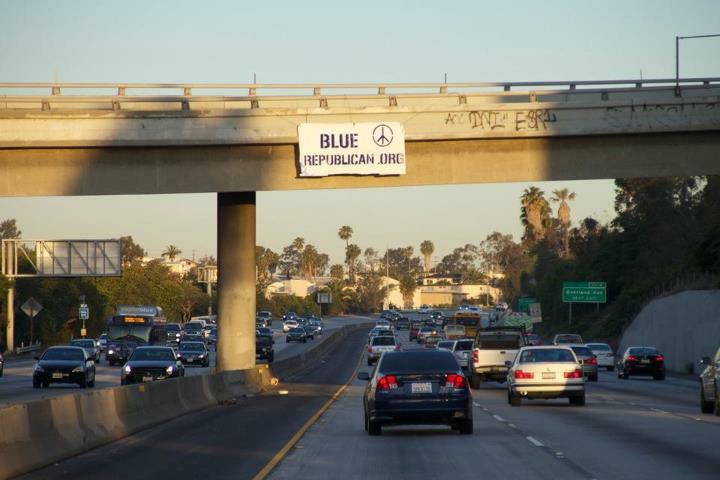 The article went viral and the term caught on, leading to the setting up of a Facebook group, the design and distribution of Blue Republican marketing materials aimed at liberals, and even all kinds of guerrilla marketing, such as the surreptitious hanging of banners over Californian freeways, and so on. People flew to the USA from all around the world to hand out Blue Republican fliers in liberal parts of the country. Blue Republican became the largest coalition in support of Ron Paul's campaign and I found myself giving in excess of 60 media interviews to explain the phenomenon that I had both named and promoted. All that happened when "Blue Republican" was nothing more than a label, identified only with a core set of principles and a respectful, welcoming approach to spreading liberty. That the liberty movement had so comprehensively failed to have spoken to the liberty-curious on the soft Left was remarkable. That a single article, providing a political identity outside the Left-Right paradigm, could reach them was wonderful and extremely exciting. Since the birth of Blue Republican, I have had the privilege of presenting on, and advocating for, individual liberty to myriad audiences. Many of them include educated, well-meaning people who are "Liberal-by-default," which is a label that would have fitted me nicely for most of my life. The "Blue Republican" group is set apart from other liberty-oriented groups by being less interested in winning philosophical purity contests than with winning supporters for Liberty, on the understanding that the most valuable principles are those that make a practical difference. My archive of writing seeks to find common ground with people who don't yet identify with the liberty movement, to develop a civil discourse that helps them see how some of the ideas, policies and politicians that they typically support frustrate their liberal principles, when those principles are properly and consistently understood. Blue Republican is not so much concerned with pushing a libertarian orthodoxy (which is bound to fail and always has), but with helping all people, and especially those who regard themselves as broadly Liberal, see how so many of our prevailing political assumptions are wrong. 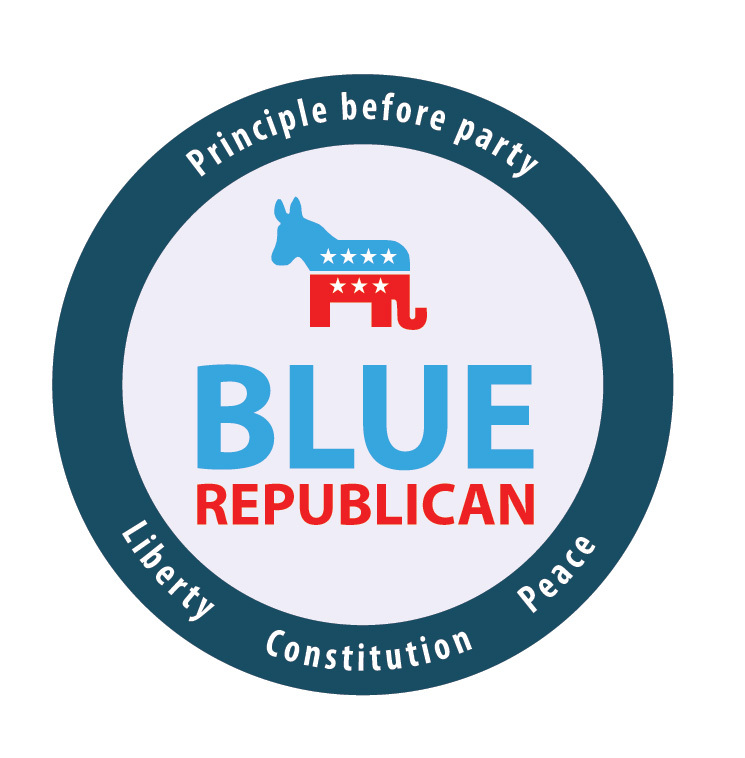 The Blue Republican seal says "Principle Before Party." There's a big market for that sentiment nowadays. Millions of Americans are already primed to reject the idea that the Left or the Right is the problem and that the Right or the Left is the solution -- but many of them haven't been exposed to an alternative account of our politics that promotes liberty without pushing an entire worldview that represents a paradigm shift too large for them to accept. Blue Republican fills that niche. The rise of Blue Republican has been concurrent with the recent remaking of the GOP from the inside by extremely enthusiastic liberty activists. This process is well underway and arguably the most exciting thing in American politics today. These (mostly young) activists are pro-peace, anti-corporatism, and pro-love, and they don't get their ideas only from the media and professors who can't help but teach what they were taught in the big-state progressive era of the '60s and '70s. These new Republicans are, in other words, driven by many of the things that many Democrats believe have been far too absent from the Republican party for far too long, and are more absent from the Democratic party than they have been for a long time. These new Republicans also include the GOP's recent intake of more libertarian politicians, such as Rand Paul and Justin Amash. The media apply the old paradigm when they say things like "Rand Paul is left of Obama on civil rights/foreign policy, but he's to the right of the GOP on regulation and taxation." Much more accurate would be to say that on the real axis of Liberty vs. Tyranny, both the established Left and Right are toward the latter end while Rand et al. are toward the former. But old paradigms are sticky. Blue Republicans, along with others, are un-sticking them. Non-neoconservatives in the West and New England have plenty of reasons to be skeptical of the GOP. The party proselytized for small government and freedom on the one hand, while sponsoring war, and the growth of government in a direction that has often appeared driven by a positively illiberal, often religious, ideology, on the other. If the GOP is going to have any value as a vehicle for liberty in the Blue states, it will be necessary to get non-dogmatic liberals not to throw out their liberal principles, but to see how their principles have not been well served by the old Progressive one-size fits-all programs delivered by a State that continually concentrates power at the expense of individual liberty. In support of a liberty-driven Republican Party, a Libertarian Party that is also being remade by a more energetic, youthful and pragmatic executive, Independent candidates and even, if they exist, Democratic candidates who share our values, Blue Republican is to establish chapters throughout the country with the goal of reaching the liberty-curious, especially in "bluer" cities, counties and states. We will not be scared to use the vocabulary of social democrats to explain to social democrats why the growing and increasingly intrusive State on which they have depended has, in nearly every case, produced outcomes at odds with their good intentions. In short, Blue Republicans are interested in finding the common ground between Liberals and (classical) liberalism from which to bring the former on a journey toward the latter. The chapters will be set up by successful applicants who demonstrate an understanding of both the philosophy and the flavor of the brand. Through their chapters, they will be able to bring to bear the weight of the Blue Republican "political franchise" in support of local candidates for anything from school board up to governor; liberty and peace-oriented events, and other groups who share our principles. (Already this year, and before this effort was launched, we have been approached by a gubernatorial candidate and even European activists for official endorsements and support. The California chapter is already being established.) Blue Republican represents a ready-made channel for political marketing and outreach for liberty-driven candidates in Blue districts, regardless of the party with which they are affiliated. Any liberty Republican who were to run for President in 2016 could do no better than have the Blue Republicans campaign for his most important ideas in precisely those places where his party has not been taken seriously for decades. He would have a doubly hard task. On the one hand, he must break down the Left/Right paradigm in the minds of the voters to an extent that allows them to see the real dichotomy of U.S. politics (liberty vs. tyranny), while, on the other, he must find a way to appeal to those who remain caught in the old paradigm and lean Democrat without upsetting his Conservative base as a Republican. Blue Republican, with its chapters throughout Blue states, will be able to offer a powerful strategic option as it can make the liberal case for Republican liberty candidates while allowing those same candidates to distance themselves from views that would, if overtly embraced, perturb the conservative base that such candidates would need to win with the support of their party's apparatchiks. If any readers would like to be part of the Blue Republican effort to become a force in American politics by building the left flanks of liberty candidates, Republican or otherwise, for offices, high and low, around the nation, they are invited to join us. The task is a huge one, and the stakes are even greater, and we need all the help we can get.